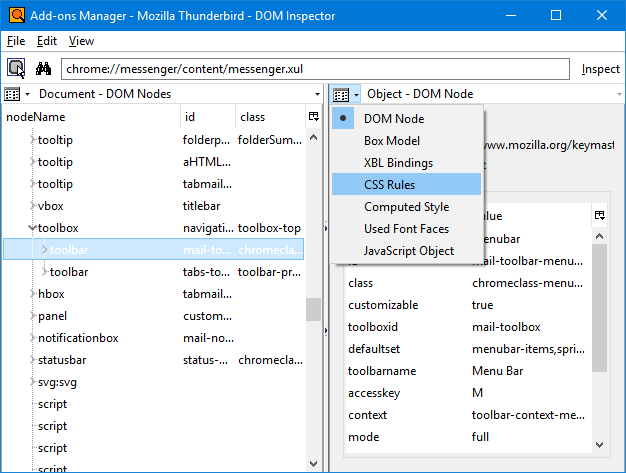 How do I use DOM inspector to find out the CSS related to mail toolbar? Baby steps, please. Last edited by DanRaisch on April 5th, 2017, 4:57 pm, edited 1 time in total. Reason: Split from original thread which died 10 years year ago. Do you have DOM Inspector installed already? You can look at the CSS rules for an element using this dropdown menu. I see a zilliion rules. How do I incorporate "them" into userChrome.css to get make changes to that particular item? You have to put in your own rules, but look at the id (or classes) to see what selectors to use. Also, it looks like that element is actually called #mail-toolbar-menubar2. Using #toolbar-menubar doesn't seem to work. libertyernie wrote: You have to put in your own rules, but look at the id (or classes) to see what selectors to use. That put a cyan background on the toolbar that has File/Edit?View/etc. I did a SH-RClick on "File" and then displayed the CSS stuff. I didn't see mail-toolbar-menubar2. I just uploaded my image to imgur.com and then copied the BBCode embed stuff here. Could you be more specific about what you want to do?